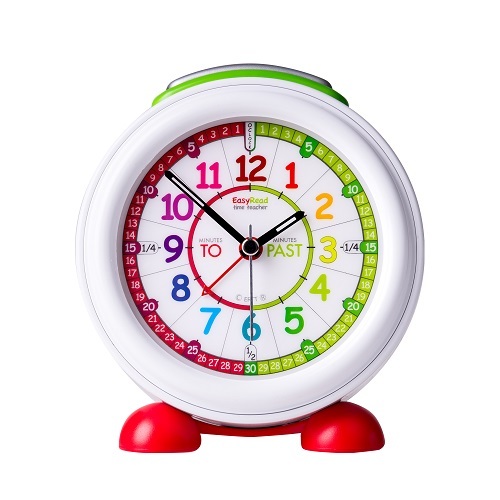 - EasyRead Time Teacher children’s electronic alarm clock with night light, 12 cm diameter. Ideal for children age 5+. - Designed to help children learn to tell the time. Supplied with a simple step-by-step teaching method, consistent with other EasyRead Time Teacher clocks and wrist watches. - Crescendo alarm, which starts with a gentle beep and gets progressively more urgent until it is turned off. Snooze button disables the alarm for 5 minutes before it starts again. - Built-in light sensor controls the brightness of the clock face, which glows gently in the dark. Pressing the Snooze button makes the clock face glow brighter, strong enough to see items on the bedside table. - Silent sweep movement so there is no annoying ticking. Ideal for a bedside clock. Battery operated – takes 3 AA batteries (not supplied).